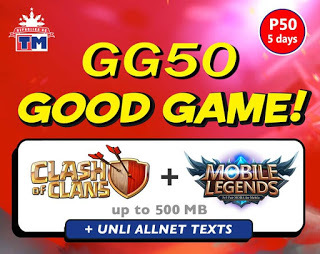 Here we go again ka-TM introducing TM GG50 – 5 Days Unli All Net Texts, Mobile Legends + Clash of Clans.You only need to spend just only 50 pesos to enjoy online gaming on your mobile phone with Touch Mobile GG50 promo. This offer is applicable to both Android and iOS users with Mobile Legends and COC (Clash of Clans) installed on their phone. You can get 500MB data allowance that you can for up to 5 days that depends on what usage you consumed. Not just online gaming experience on the go , you can also enjoy the benefit free unlimited text to all networks bundled on this TM GG50 promo. You can send text messages or SMS to your love ones and friends without any additional top up charges while you have an active registration for this package. To subscribe with the TM’s good game (GG) 50, all you need to do is reload your prepaid account then use the keyword format provided. Please take note of the pre-requisites before using this promo. You can also register TM GG30 - 3 Days Coc + Mobile Legends and all net texts. Just text GG50 STATUS send to 8080. Wait for the SMS notification from TM regarding you remaining data balance and expiry. To stop this offer, all you need to do is text GG50 STOP send to 8080. This will terminate your active subscription so you can enroll for other TM promos.